Former Weber State runner Sarah Sellers, who took 2nd in 2018, finishes 19th in women’s marathon. Jared Ward surpassed another career milestone Monday. At the Boston Marathon of all places, too. The former BYU and Davis High runner finished eighth overall at Monday’s 2019 Boston Marathon, running a career-best 2 hours, 9 minutes, 25 seconds. The mustachioed distance runner was the second-highest finishing American male, coming in just 15 seconds behind fellow U.S. runner Scott Fauble. Ward, who finished sixth overall at the 2016 Olympic Summer Games in Rio de Janeiro, was coming off a sixth-place finish at the 2018 TCS New York City Marathon in November, where he ran a 2:12:24. The 30-year-old distance runner doubles as an adjunct statistics professor at BYU, his alma mater. 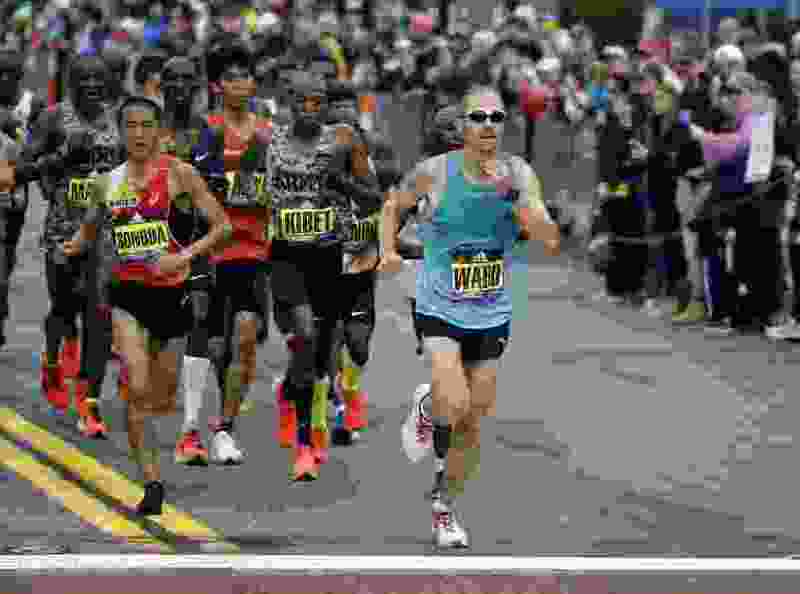 Ward led for a portion of the race Monday in Boston. Ward’s marathon times continue to improve dramatically. He bested his time at the NYC Marathon last fall by three minutes and improved upon his 10th-place finish at the 2017 Boston Marathon (2:15:28) by six minutes. Ward’s sixth-place finish in Rio signaled his arrival in the running world as the former Cougar All-American stunned the field with his Top-10 finish. He’s long had his sights set on an Olympic return. The USA Track & Field Olympic marathon trials are set for Feb. 29 in Atlanta. Ward qualified for Rio by finishing in the top three at the trials in Los Angeles three years ago. If he wants to be in Tokyo next summer, Ward will have to continue his hike upward in the sport. Lawrence Cherono of Kenya won the men’s marathon while Ethiopia’s Worknesh Degefa won the women’s race Monday. Former Weber State runner Sarah Sellers, who finished second in the women’s marathon last year in Boston, finished 19th on Monday, in 2:36.42. The 27-year-old nurse anesthetist juggles her full-time job in medicine while training to run marathons and has aspirations for the upcoming Olympic trials in 2020 and beyond.